PERCEPTION OF Er-YAG LASER DENTAL CARIES TREATMENT IN ADOLESCENTS - A CLINICAL EVALUATION. The aim of this study was to evaluate adolescents’ acceptance and pain perception of Er-YAG laser preparation in comparison to conventional mechanical preparation. Material and methods: Forty four adolescents between the age of 16 and 18 years with bilateral matched pairs of carious permanent molars participated in this study. In each patient one of the 2 cavities was prepared conventionally, the other with the Er-YAG laser. All cavities were restored with light-cured composite resin following the application of acid etch and a bonding agent. The patients were instructed to rate pain (sensitivity) during treatment according to visual analogue scale and to decide which method they would prefer for their future caries treatment. Results: The patients rated lower pain perception during laser treatment. It was found that 86.36 % of the adolescents indicated that they would prefer the Er:YAG laser preparation for further caries treatment. Conclusion: The application of the Er-YAG laser for carious tissue removal, compared to conventional mechanical preparation, is perceived as more comfortable and the adolescents prefer it for a future treatment. Zhegova GG, Rashkova MR, Yordanov BI. Perception of Er-YAG laser dental caries treatment in adolescents - a clinical evaluation. J of IMAB. 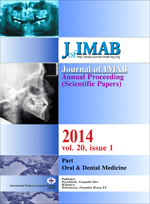 2014 Jan-Jun;20(1):500-503. doi: 10.5272/jimab.2014201.500. 6. Perhavec T, Diaci J. Comparisson of Er-YAG and Er,Cr-YSGG dental lasers. J Oral Dental Appl. 2008 Jun;8(2):87-94. 12. Boj H, Galofre N, Espana A, Espasa E. Pain perception in Pediatric Patients Undergoing Laser Treatments. J Oral Laser Applications. 2005 Feb;5(2):85-89.